I’m old enough to remember a time without mobile phones. I got my first one (a Nokia 3210 – remember those?) while at university after months of deliberating whether I would get brain tumours and whether I could cope with the commitment of a 12-month contract (remember those too??). There’s no doubt that mobiles have revolutionised our lives and we would struggle to live without them. The technology that we now carry in our pockets is fairly miraculous. But it has come at a cost – not necessarily to us, but to those involved in our phones’ creation. I have to confess complete ignorance about what goes into the technology that I’ve learnt to rely on. However I’m reading more and more about conflict minerals and it is shocking. We treat mobile phones as something to upgrade as soon as possible, with little awareness about what has gone into their creation – if we knew more, would we value them more and use them until they die? I hope so. Raise Hope for Congo has researched the use of conflict minerals, extensively mined in Congo. Check our their rankings of the largest electronics companies on their efforts toward using and investing in conflict-free minerals in their products here and buy from those companies who are taking action. Enough encourages you to take action on conflict minerals and Intel has a web hub to raise awareness. And conflict minerals aren’t the end of the things that go into our smartphones. These phones are revolutionising how we connect and live, in many positive ways. But their production also involves problems from child labour and appalling working conditions to tropical forest destruction. Friends of the Earth and The Guardian have an interactive tool which looks at how sustainable is your smartphone? But it’s not all bad news, there are a few companies who are taking on these issues and establishing alternatives so we can use our phones with a little more peace of mind. It is a Living Wage employer (much better than the Government’s misnamed National Living Wage) and the wage differential between the highest and lowest paid employee is under 1:4. It is a Fair Tax pioneer. It’s the UK’s only telecommunications provider 100% owned by its customers. They commit to buying local and to working with other co-operatives and social enterprises. It has a UK based call centre, who always answer promptly and politely in our experience. They use electricity from renewable sources and invest in renewable energy initiatives. Ethical Consumer rates the Fairphone as the most ethical phone (iPhone and my Samsung are way down the list). Fairphone puts ethical values first. They focus on sourcing materials that support local economies, and minimising social and environmental impacts. They have created a phone that’s designed to last. It uses a modular design that allows it to be opened and its parts replaced. Spare parts can be purchased to give users more ownership of every part of their phone, including its software. Check out their video. Conflict-free tin and tantalum have been sourced from the Democratic Republic of Congo and surrounding countries giving support to local communities instead of militia groups that still control most of the mines in this region. In the future, Fairphone will look into methods of recovering as many of the valuable materials used in the phone when old units are recycled at the end of their lifespan. 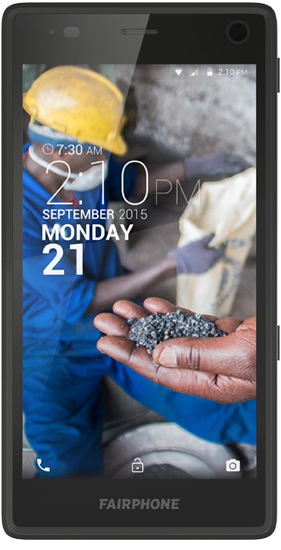 Fairphone believes in transparency and have revealed the true cost of producing mobile phones. ← Moving house … what a lot to think about!